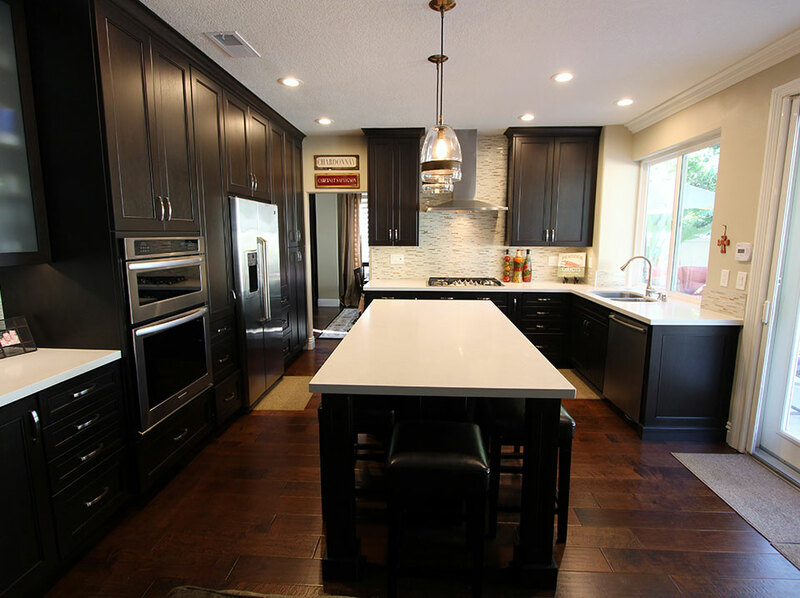 A family in Foothill Ranch wanted to give their drab kitchen a dramatic makeover that would match their own cutting edge style. The original kitchen was primarily white and rather washed out. 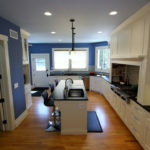 The monochromatic theme wasn’t executed as well as it could be, meaning that any distinctive features the kitchen might’ve had never visually “popped”. We sought to rectify that by reversing the color scheme and creating a bold, transitional look that can’t be ignored. The first thing we did was replace the old, lackluster floors with California Classics hardwood in “San Diego”, a richly golden nut-brown finish. This established a warm base upon which a new stylish black and white color theme would stand out. We built all-new cabinets in a Euro & Face Frame construction with Craftsman style doors out of African mahogany wood. 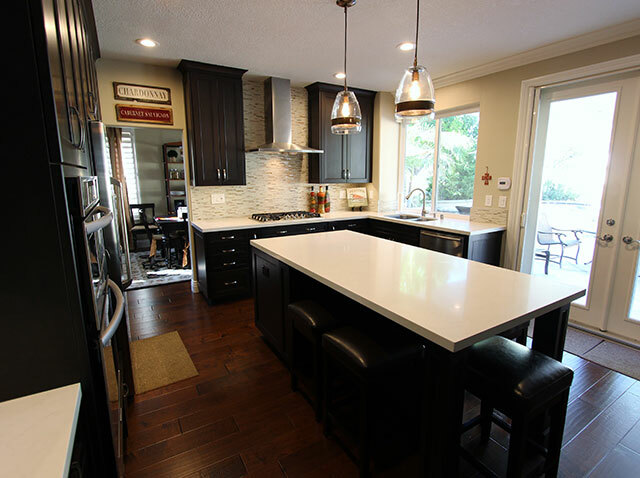 The cabinets were given a deep black finish, and they feature light hardwood melamine interiors. Light rails, hidden behind the cabinet doors, added brightness to the countertops. The cabinet construction was arranged in a U-Shape, with one side not extending as far as the other to accommodate the French doors leading to the backyard. Multiple levels of pull-out drawers were installed, especially around the cooking rangetop to put food preparation materials within easy reach. Additionally, a center island was built, with supporting posts creating legroom for the bar stool seating. 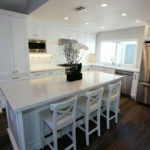 To contrast the dark cabinetry, 1 ½” Straight edge countertops in a crisp, modern white were put in. Between the upper and lower cabinets throughout the kitchen is a glass Eleganza tile backsplash, glistening in muted tones and narrow rectangular shapes. This shimmering tile is also used as countertop trim along the kitchen’s right wall. For a classy, up-to-date look, the homeowners chose all stainless steel appliances. On the right side of the kitchen is a Franke Double Bowl Sink, which is next to a Bosch Dishwasher. On the other side of the kitchen, a GE Cafe Refrigerator is neighbored by a KitchenAid 30” Convection Combination Microwave Wall Oven. All of the appliances are built into the new countertops and cabinetry, making for a clean, seamless layout. 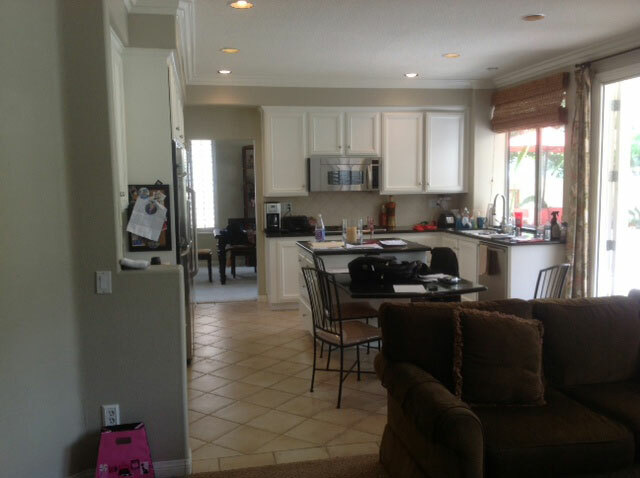 Are you looking to renovate your Foothill Ranch home? 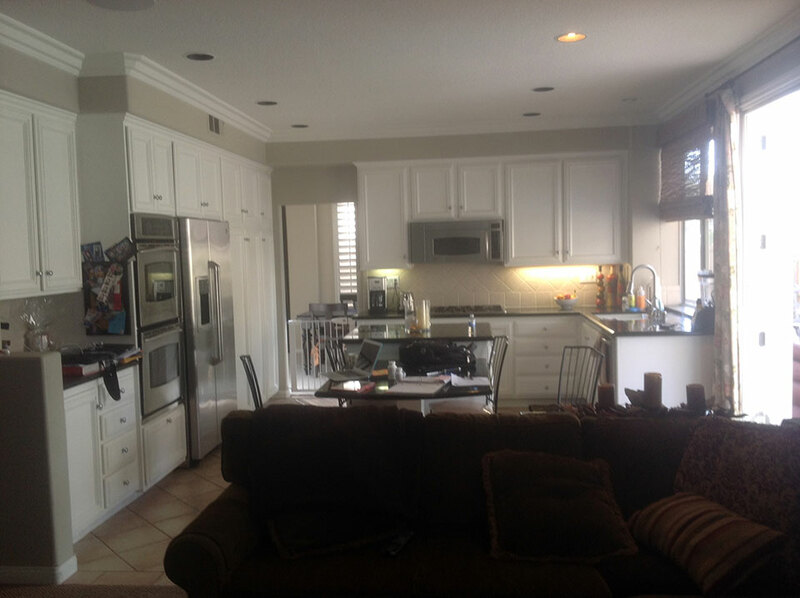 APlus Interior Design and Remodeling is a top contractor for all types of home renovations in the Orange County area, including kitchens along with bathrooms, and more. Get in touch with us today to get a quote!